The largest city of the Mekong Delta, Can Tho is also one of the most popular of Delta destinations with travellers drawn to its famed floating markets. Set at the confluence of the Can Tho and Hau (also known as Bassac) river, and crisscrossed by tributaries, canals and waterways feeding life into the region like veins, Can Tho has traditionally been an important mercantile and transport hub. The French sought to exploit the riches of Indochina and river commerce here became integral in connecting the Mekong Delta, Laos and Cambodia. Thanks to its tremendously fertile soil, Can Tho is one of the largest agricultural producers in the Mekong Delta, often referred to as Vietnam’s rice basket. You’ll see the bounty on full display at dawn at Cai Rang floating market, a wholesale market on a section of the Can Tho river. Best experienced on a private trip in a sampan, your driver will weave the wooden boat in between ships heaped with fruits and vegetables, each vessel advertising what’s for sale by hanging the product from a bamboo pole at the bow. The ship is their life—both business and family home. Smaller boats sell anything from banh mi to noodle soup to lottery tickets. There’s nothing quite like flagging down a floating cafe and enjoying a strong, sweet cup of Vietnamese coffee while watching the sale of 20 kilos of dragonfruit. The sheer volume and variety of boats and ships will amaze and after the floating market, a trip along the narrow backwaters provides further insight into a livelihood dependent upon the river—a way of life that is evaporating. The floating markets are dying as bridges and new roadways are making river transport unnecessary and vendors are seeing fewer returns. River living ain’t easy and people are seeking jobs on land, in the cities. Visit Can Tho and floating markets like Cai Rang, Phong Dien or Phung Hiep before they disappear. For travellers who are really pressed for time, it is possible to drop into Can Tho for a night, departing after the floating market/Mekong Delta boat tour returns to land around midday. We’d definitely recommend spending one night in Can Tho than doing the cheap, lacklustre “Mekong Delta day trip” from Ho Chi Minh City that moves masses to My Tho. Do find a way to squeeze out a night for Can Tho. The tourism infrastructure is well developed and affordable. But breezing through doesn’t do this great little city justice. The vibe in the Mekong Delta is palpably more relaxed and friendlier than elsewhere in the country. Not surprising, given its agricultural prowess, the food is fantastic and cheap. Fill up on fresh tropical fruit, vegetables and seafood on De Tham St and at Cho Dem Tran Phu night market, 2km from the tourist strip. Try Mekong Delta specialities like banh xeo, large, savoury fried crepes, and banh cong, a mung bean and shrimp cake. Unique noodle soups abound: hu tieu, banh canh, bun rieu and bun mam. The adventurous can give chuot dong nuong (grilled rice field mouse) a try. Given the proximity to Cambodia and the trade, unsurprisingly some of the dishes have Khmer influences. The riverfront is the life of the city. A promenade runs the length of Hai Ba Trung St and includes a pedestrian only bridge and walkway to the north, a lovely spot for a late afternoon and evening stroll—this being Vietnam, there’s a lot of selfies and a lot of colourful lights which are promptly switched off at 21:45. A stop in 19th century Ong Temple is a must for some eye-popping photos. Further south on Hai Ba Trung, the central market bustles with locals shopping in the early morning while after sunset, the night market teems with Vietnamese and foreign tourists. As with any city in Vietnam, getting out of the tourist centre will yield interactions with the locals, terrific eats, rice paddies and pretty countryside. If you’ve got time for just one destination in the Delta, this is where you should be heading. Orientation Can Tho is both city and province. It sprawls westwards from the eponymous provincial capital along the southern bank of the Hau River (also known as the Bassac River), the larger of the two branches of the Mekong. The province was actually a municipality before it was given provincial status; it was carved out of the larger original province (also called Can Tho) in 2004. The remainder formed the new province of Hau Giang. While Can Tho city is very large compared to others in the Mekong Delta, it’s manageable and relatively straightforward to navigate. Traffic is still a bit manic and it’s best to leave the driving to the locals. Most of the hotels and guesthouses targeting travellers are located at or near the river at Hai Ba Trung St. This is also where you’ll find the tour boats, travel agents, the central market, the tourist night market and promenade. Those interested in temples, we recommend Ong Pagoda on Hai Ba Trung. Modern built temples near the city centre include Phat Hoc Pagoda (Chua Phat Hoc) at the busy corner of Hoa Binh and Nguyen Thai Hoc St, and across the street from it, the Khmer temple Chua Munirensay. Admission to Can Tho Museum (1 Hoa Binh St, open Tu–Th 08:00–11:00 & 14:00–17:00, Sa–Su 08:00–11:00 & 18:30–21:00) is free but file it under the category “if you have time to kill”. The display of photos and artefacts are largely incomprehensible. Some of Vietnam’s pokey provincial museums are so bad that they are entertaining, but most will find Can Tho Museum just plain boring or confusing. ATMs are plentiful, scattered throughout the city. Please sign up as a Travelfish member to download the Can Tho guide PDF (10.1 MB, 43 pages). Membership costs just A$35 per year (less than A$1 per week) and gives you access to over 250 PDF guides. Browse our independent reviews of places to stay in and around Can Tho. 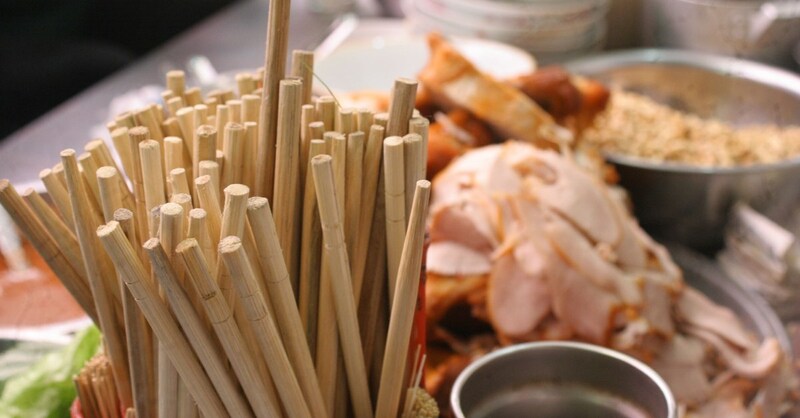 Read up on where to eat on Can Tho. Check out our listings of things to do in and around Can Tho. Read up on how to get to Can Tho, or book your transport online with Baolau. Planning on riding a scooter in Can Tho? Please read this.  Use the above map to find specific destinations in and around Can Tho which are listed on Travelfish. Bed icons indicate a guesthouse, hostel or hotel, the knife and fork is an eatery or bar and the four-way circular thingy marks sights, attractions and other points of interest. Click on any icon for a short pop-up and a direct link to the page for that spot. If you are in the area, use the teardrop icon near the top left to show your position on the map (you'll need to allow position sharing for this last feature to work).